On the 7th of October we launched the first novel from our newest author, Erin Donohue. 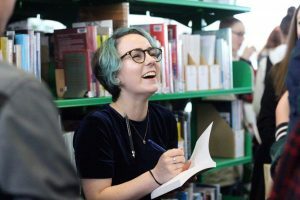 She’s had a busy couple of weeks with appearances in Wellington in the back of Te Auaha’s big yellow shipping container, and at the Nelson Arts Festival, revealing herself to be not only a talented writer but also a very moving speaker. The Apology: Stories on the Four Winds: Ngā Hau e Whā.